Focused more on sustained creepy atmosphere and anticipatory dread than cheap jump-in-your-seat thrills, The Woman in Black brings updated Hammer Horror Edwardian-era-set spectral chills to the contemporary multiplex. Magnificently shot, exquisitely paced, and making full use of the particular strengths of its famous lead actor, James Watkins’ notable, artful B-movie genre piece delivers delightful scares consistently and even rises to a rambling baroque crescendo in its showpiece sequence of accruing fear. Daniel Radcliffe stars as Arthur Kipps, a London-based widower with a young son who thinks him dour and a tenuous position at a law firm whose thin thread may be cut if he fails in his latest assignment. An old woman has died in her isolated house in the tidal marshes of the North, and Kipps is dispatched to get the deceased’s legal papers in order and hopefully to sell her home, the Eel Marsh House. The village of Crythin Gifford (wonderfully Welsh-sounding, the name seems to crawl out of characters’ mouths like a worm) is a distinctly unfriendly place to him, however, wishing him to head back where he came from and certainly to stay the heck away from the Eel Marsh House. The locals have also practically all lost children in mysterious circumstances, including the innkeepers whose three daughters simultaneously leap from their bedroom windows in the haunting opening scene. Among the bereaved is a wealthy local landed gentleman, Samuel Daily (Ciaran Hinds, a fellow Harry Potter castmate and ever a reliable screen presence), who befriends Kipps and helps him in his task as well as he can. Kipps certainly could use some help or maybe just a few more candles, because as soon as he’s alone in the Eel Marsh House (the only road in is swamped by the rising tide every day), odd sounds, apparitions, and a ghostly woman bedecked in the clothes of mourning begin to hound him. Children start to die in the town whenever he stops in on breaks from the manse, and the villagers blame him for stirring up malevolent supernatural forces in his attempts to shed light on the life and the resentments of the woman who died there. Daily brushes all of this aside as so much superstition; he’s a man of reason in his gleaming automobile, but Kipps, curious about seances and fashionable spiritualism, is less certain, especially as his observation of the house’s spectral forces accrues alarming examples. The creaking doors and furniture, winding discarded children’s toys, and recurrent appearances by a white-visaged, black-clad crone culminate in a drawn-out sequence of ghostly horror tricks and frights. Kipps overnights at Eel Marsh House, and is driven half out of his skin by one bizarre, unexplainable freak-out after another. The execution is masterful, but the relentless protraction of the sequence raises it to the level of genre brilliance. Radcliffe, a seasoned thespian of fine motor control but less-developed vocal gravitas, is used well by Watkins, observing and reacting and becoming gradually, almost imperceptibly unsettled and undone by what he witnesses. His relationship with his son, it should be noted, is a touch too fond for its historical context; Victorian and Edwardian fathers remained at a cold, studious distance from their offspring almost as a matter of course. The gothic atmosphere of everpresent death and deep mourning at lost children does strike a contextual nerve, however; in a period in which middle class prosperity was greatly expanding but disease and other factors still preyed on the young, the social construct of protection of children (as opposed to their employment in labour from a young age) was formed, and the profundity of parental mourning at their untimely death was unprecedented. Susan Hill’s novel draws upon these endemic social elements, and Watkins’ film of that novel does as well. 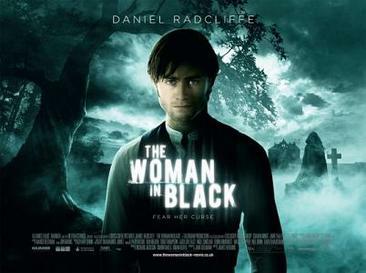 The Woman in Black was a successful commercial and critical comeback for Hammer Films, the venerable British production studio whose gothic horror films in the 1950s, 1960s, and 1970s lent a prestige and sophistication to B-level genre releases and made icons of the likes of later blockbuster supporting figures Christopher Lee and Peter Cushing. It may not engage with the tropes and expectations of the horror genre like meta-horror flicks like Scream, The Cabin in the Woods, or The Ring, although it does share the latter’s teasing faux-resolution of the proper Judeo-Christian burial dispelling the haunting spirit, which will not be so easily placated. It’s a revived old-school creepy ghost story executed to maximum effect, and that can be enjoyed on a completely guilt-free level of its own. Good review. Not really great, except for that bit where the ghost screws around with Radcliife in that house for at least 15 minutes. Now that was something to watch.